Years ago, employers’ biggest concern about communication during work hours involved employees using the business’s phone line to make expensive long distance phone calls on company time and with company money. However, the days of paying for long distance phone service have mostly gone the way of dial up internet connections and Facebook as solely a college student hangout. But in its place, a new concern has America’s employers complaining: text messaging at work. Texting at work is a huge concern for many employers, and the question of what kind of policy to implement against the practice – if any policy at all – has companies everywhere scratching their heads. They’ve heard and read that texting at work should be discouraged, but is it really such a big concern? And if it should be addressed, how strict should the policy be? And what are the repercussions of implementing such policies? It’s understandable that you fear texting at work will kill your company’s productivity, and in some cases, it truly does. However, it’s also important to consider your employees’ feelings on the issue. Why do employees’ feelings matter, you ask? Well, consider the inextricable link between morale and productivity. Now consider the impact that a company-wide cellphone ban would have on employee morale. You have to admit that the repercussions could, in some cases, be very severe. Remember that many employees, especially those of the younger generation, rely very heavily on cellphones and texting as a primary means of communication. Therefore, banning cellphones in your business could induce downright panic among many segments of your company, as many people depend on these devices to receive “check-in” notifications from children, spouses, and other family members. In addition to spawning fear in employees about what they are to do in the event of an emergency, you also risk making them feel isolated. Many people rely on the occasional text message from a loved one to give them the mood booster that they require to get through the long work day. If you ban even occasional cellphone use, you also eliminate these much needed pick-me-ups, and you risk killing employee morale and productivity in the process. 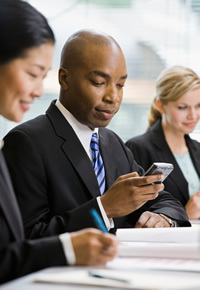 Unfortunately, there is no one-size-fits-all for company policies regarding cellphone use. Your company’s policy for text messaging at work will depend entirely on your company’s size, area of expertise, and culture, as well as the overall productivity of your workers. Despite the fact that not every policy is a good fit for every company, considering your business’s size is a good place to start when developing an employee texting policy. If your business is small, rather than banning cellphones entirely, consider allowing them on a case-by-case basis. Give all employees the benefit of the doubt, at least until they provide you with a reason to no longer do so. If they abuse the privilege of texting at work, and their productivity suffers, remind them of their responsibilities and the repercussions for not meeting those responsibilities. If this is ineffective, follow through with disciplinary action, such as verbal or written warnings as per your company’s policies regarding workplace duties. This type of individualized policy tends to work extremely well. The only exception would be extremely large companies who do not have the time or resources (although this act requires very little time and very few resources) to monitor their individual employees’ texting habits in relation to their productivity. In these rare cases, a company-wide ban might be appropriate, as long as you allow for exceptions for individuals in extenuating circumstances, such as those with a child staying home sick from school or those with a spouse in a dangerous line of work. The best policy regarding texting and cellphone use for your company will be one that was developed specifically with your business and employees in mind. Before making a sweeping ban on cellphones throughout your company, ask yourself whether cellphone usage really is acting as a drain on productivity. And if the answer is yes, is it all employees who are affected, or is it one individual in particular? The worst thing you could do in this case is to give the impression that you’re punishing the entire company for one person’s irresponsible insistence on pushing the limits of your flexibility. In short, while developing a texting and cellphone policy, it is extremely important that you make every effort to consider your employees’ needs as well as your own. *Please note: Should you choose to allow cellphones and a reasonable amount of texting at work, remember that personal phone calls made during work hours (including those made on cellphones) are a separate issue. While texting is quiet, private, and quick, phone calls made near other employees can be extremely disruptive and should be treated as such. If you choose to permit texting in the office, cellphones should be set to vibrate in order to minimize sounds that will inevitably annoy those nearby. A very nice article on texting at the workplace. It made me aware of the areas which I had never explored before. I was taught texting on company time was misuse of it and its considered stealing. One company i worked for had this view. While it’s completely understandable that texting or cell phone browsing when face to face at the jobsite is rude and unprofessional, most people who text at work are smarter than that. In my opinion, as long as productivity isnt compromised a person should be allowed to apply modern technology to their work life. Sending a text message only takes several seconds out of a persons time. Even if texting all day, that only adds up to a few minutes of downtime. Facebook or calling on the phone is way more compromising. For me, I only text which cuts off about 5 minutes of my total 8 hours. When im not texting im a hard worker. And I dont take lunch either so taking a few seconds out of my work flow isnt going to hurt the company or my paycheck. We have employees that text endlessly. It’s not just a matter of sending a text, but also the distraction of the thought that goes in to it. I often get distracted at work by people that don’t respect the fact that I’m working and trying to concentrate. I respond once and some people text over and over and it seems rude to not text back. To keep my productivity up, I ignore non emergency text all together until I take lunch or a periodic break. I’m paid by the company to work, so that’s what I do when I’m on the clock. Anything else is not giving my very best. The company has their standards, and I have my own. Wish my every staff has such sensibility you have. Most of them abuse and have their phones beside their PCs and keep checking and replying every other minute or so frequently that it becomes a distraction to their desk bound jobs that require quiet analysis. Perhaps nature of work matters, I feel that those who are stay put in office (vs those that are on the run doing sales for example) have no reason to keep texting. I agree that this is a case to case basis and it depends on what your job actually is. In a case where you are a massage therapist and you are using your phone on the job it might be a little unprofessional.